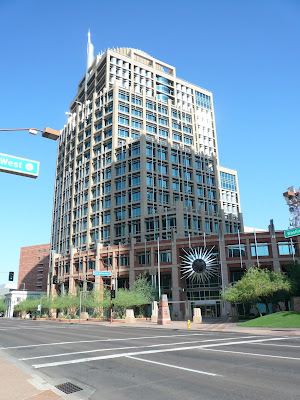 The 20-story Phoenix City Hall was completed in 1994 and was designed to be energy efficient harnessing the sun’s energy when needed. The architect, Langdon Wilson’s design was simple yet distinctly southwestern. The building is topped with a round stainless steel crown and spire that makes it easy to spot in the downtown skyline. The giant sunburst above the entrance pays homage to our desert sunshine. The building houses 1300 city employees including the mayor, city council and city manager. I like that there is a variation in the window patterns and shape of the building. It adds visual interest and is more attractive than the square box, boring repetition of so many high rises (such as the Wells Fargo building right next door to City Hall). And the modern air conditioning system in the City Hall building furnishes the air conditioning for the historic, grand Orpheum Theater next door, which enabled the renovation and reuse of the theater, which you showed in an earlier post. I should have added to my initial comment that the current City Hall shows rapid growth of Phoenix. It is a lot different than what you would expect a city hall to look like for the 5th or 6th largest city in the country. It is certainly different than the city halls for major cities inthe East and Midwest. Sharon, maybe sometime you can show a photo of the old city hall across the street, which when it was built was the city hall on one side and the county courthouse on the other side. One building could take care of both functions. I just love that sunburst! What a great idea! I enjoyed your sense of humor regarding the number of city employees, although Phonix has actually gotten awards for being a well run city. However, I will say that it struck me that the Phoenix city employees must have not enough to do one time when a City employee came out to our street when I lived in Phoenix to clean up little grease stains on the pavement of the street. Our neighbor had called City Hall to complain that the garbage trucks dripped little drops of grease on the asphalt. I never knew that asphalt was supposed to be so clean. My dear friend, Jack Black, was the lead architect from Langdon Wilson for the design of this building. Great job Jack!